A primates & savanna wildlife safari adventure to Queen Elizabeth National Park, home of the renowned tree climbing lions and its abundant wild game and birdlife. Later the safari continues to Kibale Forest National Park home to the largest number and variety of primates in the whole of East Africa and is crowned by a nature walk in the Bigodi Swamp to watch rare species of birds. You will depart Kampala in the morning after breakfast and travel westwards through Uganda’s beautiful green countryside to the Queen Elizabeth National Park. The journey will take 6-7 hours with stopovers at areas of tourist attraction such as the Royal Drum makers’ village and the Equator for an opportunity to stand in two hemispheres at the same time. You will continue through the savannah grasslands with lots of banana plantations and several herds of local long horned Ankole cattle endemic to this part of the country. You will get to Queen Elizabeth National Park in the evening. You will wake up early for a morning game drive in the park during which you will see Lions, Elephants, Topis, Leopards, Bush bucks, Cape Buffaloes, Defassa Waterbucks, Giant Forest Hogs, Uganda Kobs, among others. In the afternoon you will go for a two hour boat cruise on the Kazinga Channel which connects Lakes George and Edward and view concentrations of giant hippos, elephants and crocodiles among others. You will also see many varieties of birds at the water shores. On the Drive to Kibale National Park you will be able to enjoy an impressive sight of the legendary “Mountains of the Moon” which you will clearly see on the road to Fort Portal. You will, after breakfast, head to Kibale Forest National park to view the primates. 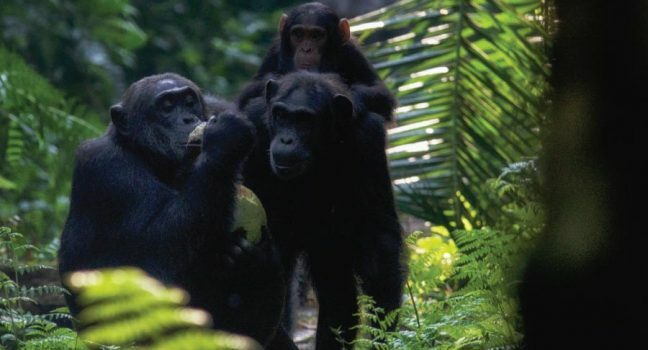 The activity begins at 8.00am with a briefing of the rule for trekking the chimpanzees after which you set off to search for them in the forest. The exercise takes half a day and along the way you will see other primates such as Grey cheeked Mangabeys, Phoestes, Red-Colobus and the Blue tailed and the Red-tailed monkeys swinging in the branches of this thick forest. After breakfast set off to return to Kampala then Entebbe International Airport to catch you’ evening flight back home with memorable experience.